Flavored Gin is a harsh sell among gins. Most of the time, the target market for these sort of things is looking for something which is purely the flavor on the bottle. This is where pineapple vodka comes in: it’s pineapple and not much else. But flavored gin is this completely different animal: we’ll give you your pineapple and give it some juniper at the same time. 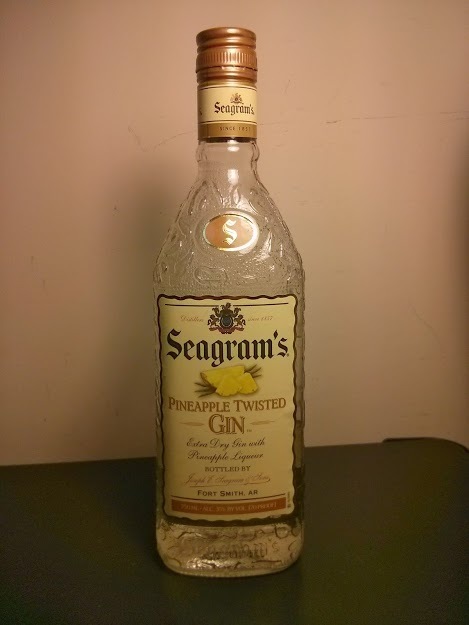 Hello, Pineapple Twisted Gin— another flavored gin in Seagram’s long line of them. You can craft some cocktails around these gins and come up with some fairly good results. But they don’t really work too well in classic cocktails. Mixed drinks, sure, but cocktails no. So I won’t be overly negative and go into the reason why this makes a weird Negroni or less than stellar Aviation. Chances are, if you’re looking for a flavored gin, you’re not looking for something which does those things*. Bright and strongly pineapple on the nose. Pineapple candy, pineapple ice cream, maybe even those pineapple Dole Whip that I so loved from the last time I was at Disney World. It’s that kind of pineapple on the nose. I think you’d have to be a real snob to not admit there’s something inviting and intoxicating in the aroma this gin gives off**. Sure it’s not sophisticated, but it sure smells fun. Right? The taste of Pineapple Twisted Gin is initially pineapple and tropical fruit salad. Sweet with a slight bitter hint. Juniper is present slightly in the middle, but not too strong. Finish is floral with faint pineapple and papaya notes. Very smooth, very easy to drink. Not as overly candy like as the nose might indicate. A nice balance for a flavored gin, clearly pineapple but not over the top. A hint of juniper keeps it grounded. Gin snobs and purists need not apply. But it’s really not too bad. I love the way it compliments juices like lemonade or orange juice. Adds a nice pineapple note and even a slight touch of juniper. Deceptively alcohol free tasting. You could drink a good deal of these and not feel a thing. So please, be careful out there***. The gin and tonic seems to be the target drink with this gin and it surely delivers. Nice pineapple taste. The bitter notes on the finish are amplified, but I think it lends it a balance to it. Sweet at first, pineapple dole whip and a bitter juniper jab on the tail. It’s not quite what you might have expected at initial taste, and its quite nice. It’s supposed to be fun and more so than many other flavored gins, Pineapple Twisted Gin delivers. It has some juniper, it has some pineapple. It tastes good for what it is. *And if you do, more power to you. But you know where I stand on the issue. ** Or maybe you hate pineapple candy? I mean, I suppose it’s possible. The taste is not the same, Since 2010 or 2011 something is wrong with the taste so I can no longer by may favorite spirit. Its to sweet.